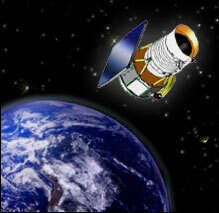 An artist’s conception of the WISE satellite in orbit around Earth. WISE is an unmanned satellite carrying an infrared-sensitive telescope that will image the entire sky. Since objects around room temperature emit infrared radiation, the WISE telescope and detectors are kept very cold (below -430° F /15 Kelvins, which is only 15° Centigrade above absolute zero) by a cryostat -- like an ice chest but filled with solid hydrogen instead of ice. Solar panels will provide WISE with the electricity it needs to operate, and will always point toward the Sun. Orbiting several hundred miles above the dividing line between night and day on Earth, the telescope will look out at right angles to the Sun and will always point away from Earth. As WISE orbits from the North pole to the equator to the South pole and then back up to the North pole, the telescope will sweep out a circle in the sky. As the Earth moves around the Sun, this circle will move around the sky, and after six months WISE will have observed the whole sky. As WISE sweeps along the circle a small mirror scans in the opposite direction, capturing an image of the sky onto an infrared sensitive digital camera which will take a picture every 11 seconds. Each picture will cover an area of the sky 3 times larger than the full Moon. After 6 months WISE will have taken nearly 1,500,000 pictures covering the entire sky. Each picture will have one megapixel at each of four different wavelengths that range from 5 to 35 times longer than the longest waves the human eye can see. Data taken by WISE will be downloaded by radio transmission 4 times per day to computers on the ground which will combine the many images taken by WISE into an atlas covering the entire celestial sphere and a list of all the detected objects. Read the WISE mission Fact Sheet PDF (1.7 MB). Read the WISE Launch Press Kit PDF (2.0 MB). WISE in a box: Create your own 3-D model of the WISE spacecraft.